Heather Heyer was killed by an alleged white supremacist during an alt-right rally in Charlottesville, VA on August 12, 2017. Heyer’s murder drew condemnation from Charlottesville and most of the country. Jason Kessler, the organizer of the rally, held a press conference the next day where he disavowed the violence and blamed the city of Charlottesville for Heyer’s death. Kessler’s press conference drew protestors who booed and shouted at him. One of the protestors, Jeffrey Winder, struck Kessler in the head. The ridicule was warranted. Jason Kessler had known the victim of his rally; the elder Kessler recalls that Heyer had been part of their church group when his son was younger. That didn’t stop Jason Kessler from tweeting out after the rally that “Heather Heyer was a fat, disgusting Communist.” In August 2018, Kessler live streamed a video complaining that all the civil lawsuits filed against him had forced him to move back in with his father. A moment later, the senior Kessler can be heard demanding that his son stop making white supremacist content in his house. 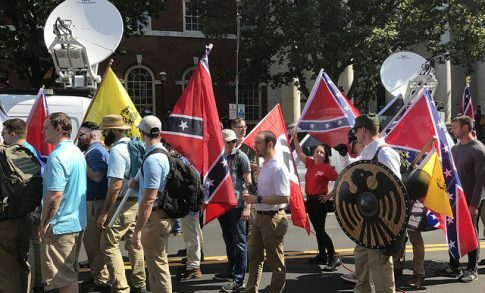 Despite the complete disaster that the 2017 alt-right Charlottesville rally turned into, Kessler still attempted to hold a 2018 alt-right Charlottesville rally. Charlottesville denied the permits. The rally was held across the street from the White House instead. Jury nullification is the concept that juries can overrule the laws created by legislators and enforced by prosecutors in favor of social norms that the jury would prefer. Nullification has been an issue since the founders rejected the use of professional juries in favor of a jury of one’s peers. Nullification is even more tempting when juries do not have to explain their reasoning. The $1 fine here is not entirely jury nullification. The jury still found Winder guilty of assault, even if the sentence imposed was minimal. A complete jury nullification would have found that Winder was not guilty even though the evidence is undisputable that he had punched Kessler in the face. Jury nullifications are controversial because it means that the jury essentially ignores the law and/or the evidence in favor of its own ideas. People who identify with Kessler probably feel that their peers do not respect them. Nullification is arguably just if the laws being enforced are unconstitutional or if the prosecutor clearly has a motive other than enforcing the law. Neither are good arguments though. Declaring laws unconstitutional is the job of an appeals court, not the jury. If a prosecutor is running amok, he should be dealt with at the polling station, not the courtroom (voting him or his superior out). Furthermore, nullification has been used to help actual criminals escape. Manafort escaped conviction of ten conspiracy charges in August 2018 only because one juror refused to convict him, even though he wouldn’t explain why not even to the other jurists. Historically, Klan members could murder black people without worrying about being convicted because they knew the all white juries would nullify the charges. Winder’s sentence was a product of Kessler’s own stupidity. First, Kessler made the mistake of blaming the city and the protestors the day after his rally had killed a woman he grew up with. This doesn’t justify what Winder did, but the jury almost certainly felt Kessler had it coming. If juries emphasize with the defendant over the “victim,” it shouldn’t be shocking when they advise the court to treat the defendant with kid’s gloves. Second, Kessler’s own pathetic testimony likely assured the jury that a $1 fine was appropriate. Kessler testified that the only thing Winder had injured was Kessler’s pride. If the “victim” hadn’t been injured, then the punishment need not be as severe. On the other hand, if Kessler had suffered greater injuries, such as a broken jaw, then Winder would likely have faced a harsher penalty. Winder received a $1 fine because Kessler himself downplayed the seriousness of the offense and emphasized what a terrible person Kessler had become. Was the Punishment Appropriate for Winder? It is understandable how the jury arrived at a penalty of $1 fine and no jail time, but Winder should have been given a tougher sentence. To be sure, legal precedent suffers no consequences for imposing a lighter sentence. Trial courts follow precedent established by appellate court decisions; jury recommendations do not factor into judicial precedent. However, Winder’s sentence still poses a problem. The Trump administration is eroding political norms and purposefully dividing the country. The only way abstract concepts like equal protection and rule of law can survive is if the law is applied equally. It does not matter if Kessler is human pond scum. He should enjoy the same protection everyone else does. When the law is broken, everyone should receive the same penalty, regardless of whether they are a neo-Nazi or a counter protestor. Both sides should be treated equally when the same crimes are committed.